Hyaluronic acid for hair health. As HA nurtures skin it improves hair follicle health and helps to regulate hair growth cycles (50). And, Hair growth can be impeded by UV damage to the scalp. While some sun exposure is good for skin, helping to produce nutrients like vitamin D, too much damages skin. UV damage leads to inflammation, the activation of tissue degrading enzymes (MMPs), and damage too, or death of, keratinocyte cells (50). Keratinocytes help protect the skin of the scalp and the hair follicle from UV damage. And, keratinocyte cells are germinated in, or grown in, hair follicles, which are usually self renewing, they cycle and regenerate. So, anything damaging to keratinocytes is also damaging to hair follicles, which can lead to hair thinning and baldness. How HA assists with joint health. Hyaluronic acid is a component of human bone, joints, and connective tissues like tendons and cartilage, particularly hyaline cartilage. The last is especially important as it provides cushioning to bones by covering their ends. So, in this way HA assists in bone health by protecting it from wear and tear, and thus it lessens the pain and tenderness connected to degenerative joint diseases. HA can also a component of the joint’s synovial membrane. This part of the joint coats or covers the articulating bones. This coating secretes a viscous fluid called synovial fluid. This is what absorbs shock, and assists in keeping the joints elastic. Synovial fluid also carries nutrients to cartilage. HA is FDA approved in the U.S., in injection form, to treat osteoarthritis (provided by a healthcare professional). it is also found in osteoarthritis pain/injury related supplements (6). Hyaloroinic acid (HA) may help to preserve bone strength. Two animal studies have shown that HA suppliments can slow rates of bone loss in animals with osteopenia, a condition that often precedes osteoporosis (30 806;31 807). And, in test tube studies, high doses of HA can increase the activity of osteoblast, the cells from which new bone tissue grows (32;33). HA has been shown in clinical research to relieve joint pain an lubricate bones. This substance is found in the joints and it helps lubricate the space where the bone meets the joint (34). Some research indicates that low dose HA supplementation can effectively reduce joint (especially those of the knees and elbows) related stiffness and chronic pain (7). Hyaluronic acid supplements for joint pain are available in the U.S. There are several treatments based on HA that have been approved for osteoarthritis of the knee. Four such products, made from rooster or chicken combs and sometimes bacteria, are Hyalgan, Orthovisc, Supartz and Synvisc (8). Taking 80 to 200 mg per day of hyaluronic acid (HA) supplements for two or more months has been shown in clinical research to significantly reduce knee pain in those aged 40 to 70 who were suffering from osteoarthritis (9 803). HA injected into the joint seems to only lead to a modest reduction in pain, and it can lead to mild pain reduction, but this treatment often leads to complications (10). Those over the age of 18 can take 50 milligrams of HA by mouth once or twice a day, with food. Those with osteoarthritis have found relief after eight weeks by taking supplements of 80 mailgrams, with 60 to 70 percent being hyaluronic acid. Injections to control inflammation and pain are also available from a medical professional. These can involve injection 20 milligrams into the joint once a week, for serval weeks. That said, mixing injections with oral supplements has been shown to lengthen the pain-relieving benefits, while stretching the time between injections (11). How HA assists in eye health and comfort. Hyaluronic acid is the main component of a fluid within the eye socket, called the vitreous humor. This is why HA based eye drops (brand name Hyalistil) are now used to treat chronic dry eye. This product helps in tear production, the restoration of fluid balance, and the replenishing of moisture in the eye socket (12). HA is being shown, in studies, to suppress UV light based oxidative damage to the cornea (13). Eyes are made in part of hyaluronic acid and type II collagen, in the forms of gelatinous tissue and fibrous tissue. With age, production of both of these can slow. This can result in glaucoma and cataracts (14). After the age of 50, the risk of developing cataracts increases (15). Glaucoma (increased pressure in the eye due to an inability to drain normally accumulating fluids) is in part due to an age related loose of collagen, which helps support the eye and allows for proper fluid drainage. Glaucoma leads to blindness. HA based lubricants are now commonly used to treat eye disorders (including cataracts) and injuries. They are also used pre and post operatively to aid in the recovery form surgeries for cataracts, detached retinas, and corneal transplants. To help lessen the likelihood of developing either glaucoma or cataracts take collagen or collagen rich foods, consume hyaluronic acid rich foods (poultry, beans, and red coloured fruits), and take omega 3 fatty acids (16). To treat dry eye with HA, use eye drops three to four times per Day, for up to three months. Try to find drops with a concentration of HA at 0.2 to 0.4 percent. Read directions carefully. Hyaluronic acid (a) supplements may be an alternative treatment for dry eye. This is as it is great at retaining moisture. You can also get eye drops which contain from 0.2 to 0.4% HA. These have been shown to improve eye health and reduce the symptoms of dry eye (47;48;49). To help reduce the likelihood of developing either glaucoma or cataracts take collagen supplements, or collagen rich foods, and consume hyaluronic acid rich foods (poultry, beans, and red coloured fruits), and take omega 3 fatty acids (16). How HA can help protect the gastro-intestinal tract. Taking hyaluronic acid (HA) supplements may help reduce acid reflux symptoms. In a study using HA on tissue samples in a test tube, HA mixed with chondroitin healed acid-damaged tissue quicker than no treatment (17). So, it is possible that HA can help to soothe and repair the damage done to the esophagus by stomach acid, which is regurgitated into the throat during acid reflux. A human study of HA, mixed into a supplement form with chondroitin and administered with an acid reducing medication, decreased reflux symptoms by 60% more than only taking acid reducing meds alone (18 821). 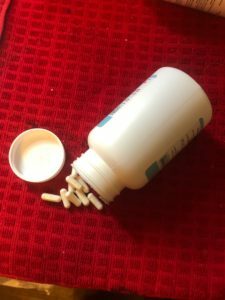 When this supplement mix was compared to a placebo, the supplement mix was found to be five times more effective (19). Taking chicken-based collagen can help the body make HA. HA is naturally present in the large particles of the gut that protect it from, and repair damage done by inflammatory bowel diseases (Chhorn’s, leaky gut syndrome, and ulcerative colitis). You can encourage your body to naturally heal from such issues by consuming HA rich foods or supplements. These include bone broth, protein powder made from it. Please, keep in mind that the overuse of isolated HA, which has smaller particles than naturally occurring ones, can sometimes result in increased inflammation in the gut (20). Information about HA and how it works in the body tissues. Hyaluronic acid is a glycosaminoglycan, meaning it has the capability to maintain a high viscosity while holding a lot of water. It is considered to be a lengthy link of carbohydrate molecules which are bound together. These molecules hold water, so they provide a way for fluids to move in the body and for fluid related pressure to be absorbed. The most important fact about HA is its ability to retain water throughout the body (skin, eyes, joints). In short, hyaluronic acid has a great capacity for retaining water, whether on the skin, in the eyes or within soft tissue. It is present in a variety of bodily tissues, but the majority of it, 50%, is in the skin. It is here where HA provides structure and moisture. Aside from the skin, HA is prevalent in joints, tendons, skeletal tissues, synovial fluid, the eyes, heart (aorta and valves), lungs, and prostate. Emerging research on HA has shown that it has many important roles in the body. These include the following: repairing injury of fibroblasts (these are the cells that synthesize collagen, produce the structural framework for tissue, and play a critical role in wound healing); HA helps to sustain epithelial cells (cells on the outer surfaces of organs and blood vessels, and the inner surfaces of cavities in many internal organs); it hydrates tissues; it fills the spaces in tissues and between cells; HA helps to build a framework via which cells can migrate; HA assists in controlling inflammation via regulating the activation of inflammatory cells; it assists in the immune response; it partakes in the repair of tissues and wounds; it even lubricates joints (21). How Hyaluronic Acid Works in the tissues. There are a variety of HA molecule sizes. This is a main reason that HA can have so many different functions within the body. The larger molecules are antiangiogenic and immunosuppressive. Antiangiogenic means the process through which new blood vessels form from pre-existing vessels. This is the process that continues the growth of the vasculature by processes of spurting and splitting. Immunosuppressive means the larger HA molecules can slow or stop an immune response. These larger molecules can be found in healthy tissues. These control dehydration, inflammation, and free radical damage. Smaller HA polymers can send signals of distress to the immune system, and so can raise or increase inflammation to help in the repair or wounds or assist in healing injury. Hyaluronic acid is in a class of (essential) membrane proteins called hyaluronan synthases. These proteins form the basis of hyaluronan synthesis within the body tissues. this process is vital to maintaining health. These are the basis of hyaluronan synthesis in the body, which is vital to health. People have three kinds of hyaluronic acid synthases for creating HA (HAS1, HAS2 and HAS3). HA plays a significant role in the central nervous system, CNS, in that it plays a role in cell migration and cell signaling. Hyaluronan does this by binding to two hyaluronan receptors, DC44 and RHAMM (22). Hyaluronic acid supplements for joint pain are available in the U.S. There are several treatments based on HA that have been appr9oved for osteoarthritis of the knee. Four such products, made from rooster or chicken combs and sometimes bacteria, are Hyalgan, Orthovisc, Supartz and Synvisc (23). Please, keep in mind that the overuse of isolated HA, which has smaller particles than naturally occurring ones, can sometimes result in increased inflammation in the gut (24). Adding hyaluronic acid-rich foods and supplements to an existing diet can encourage the body to heal itself by supporting the gastrointestinal systems in protecting and repairing itself. These supplements include bone broth or protein powder made from bone broth (25;27). Hyaluronic acid, HA, is naturally found in the body, and is in every connective tissue and organ (skin, blood vessels, serum, cartilage, brain, heart valves, and synovial fluid). HA production diminishes with age. A person 75 years old has only 25% of the HA naturally present in the body that a 19-year-old would have (2). Hyaluronic acid: food sources of hyaluronic acid (HA) include the following: grass fed meats , especially beef, poultry and pork; bone broth and organ meats; starchy root vegetables contain some HA, and they boost production of it as they have many helpful nutrients (fiber, potassium, vitamins B6 & C), this is especially true of yams, but also potatoes, sweet potatoes, tubers like jicama & Jerusalem artichoke; isoflavone rich soy-based foods enhance the production of HA. Also eat fruits high in naringenin, which inhibits the breakdown of HA, these include citrus fruits, tomatoes, and bananas. Bananas also contain a bit of HA, magnesium and vitamin C. Vitamin C and magnesium both help galvanize the production of HA; foods high in both are: citrus fruits like grapefruits & oranges, tomatoes avocados, cherries, grapes, and mangoes, bananas; sweet peppers are high in vitamin C; magnesium rich foods help include nuts (almonds and cashews are high in magnesium), seeds, leafy greens like spinach, kale and swiss chard, and avocados, dark chocolate has small amounts of magnesium, but it also has zinc, which helps HA production and it contains flavanols (bioactive compounds or plant derived nutrients which promote healthy blood vessel function); beans also contain both zinc and magnesium; and, red wine has phytoestrogens which help in HA production (26). Cautions about HA. If you take medications that thin the blood, like aspirin or warfarin (Coumadin), don’t take HA supplements, these can increase the risk of bleeding. If you have a history of cancer be cautious about taking HA. Keep in mind that HA is associated with increased blood vessel formation and fibroblast migration in tumor formation. And, the correlation of the aggressiveness of a tumor with the level of HA on the tumor cell’s surface has also been reported (3). The U.S. federal drug administration (FDA) states that HA related products are usually safe when used topically or taken orally. Those who are pregnant, or breast feeding, should avoid using it as may negatively affect the development of a baby or fetus. 2 Oe, M., Sakai, S., Yoshida, H., Kaneda, H., Okado, N., & Masuda, Y., (2017). Oral hyaluronan relieves wrinkles: a double-blind, placebo-controlled study over a 12-week period. Clinical Cosmet Investig Dermatol, 10: 267-273. 4 Kawada C Yoshida, T., Yoshida, H., Matsuoka, R., Sakamoto, W., Odanaka, W., Sato, T., Yamasaki, T., Kanemitsu, Masuda, Y., & Urushibata, O., (2014). Ingested hyaluronan moisturizes dry skin. Nutrition Journal 13(70). DOI: 10.1186/1475-2891-13-70. 6 Web MD website. Webpage: Hyaluronic acid. Accessed at: https://www.webmd.com/vitamins/ai/ingredientmono-1062/hyaluronic-acid). 7 Wang, C.T., Lin, J., Chang, C.J., Lin, Y.T., & Hou, S.M., ., (2004). Therapeutic effects of hyaluronic acid on osteoarthritis of the knee. A meta-analysis of randomized controlled trials.Journal Bon Joint Surg, AM 86-A (3):538-45). 9 Tashiro, T., Seino, S., Sato, T., Matsuoka, R., Masuda, Y., & Fukui, N., (2012). Oral administration of polymer hyaluronic acid alleviates symptoms of knee osteoarthritis: a double-blind, placebo-controlled study over a 12-month period. Scientific World Journal. 2012;2012;167928. DOI: 10.1100/2012/167928. 10 Rutjes, A.W., Juni, P., da Costa, B.R., Trelle, S., Nuesh, E., & Reichenbach, S., (2012). Viscosupplementation for osteoarthritis of the knee: a systematic review and meta-analysis. Ann Intern Med. 157(3):180-191. DOI: 10.7326/0003-4819-157-3-201208070-00473. cross- over study. Cornea.,27(10):1126-30. DOI: 10.1097/ICO.0b013e318180e55c. 14 Mishra, G., Das, G.B., & Behera, H.N., (1997). Possible role of lens collagen in cateractogenesis. Indian Journal of Ophthalmology, 45 (4):227-231. 17 Di Simone, M. P., Baldi, F., Vasina, V., Scorrano, F., Bacci, M. L., Ferrieri, A., & Poggioli, G. (2012). Barrier effect of Esoxx(®) on esophageal mucosal damage: experimental study on ex-vivo swine model. Clinical and experimental gastroenterology, 5, 103-7. 18 Savarino, V., Pace, F., Scarpignato, C., & Esoxx Study Group (2017). Randomised clinical trial: mucosal protection combined with acid suppression in the treatment of non-erosive reflux disease – efficacy of Esoxx, a hyaluronic acid-chondroitin sulphate-based bio adhesive formulation. Alimentary pharmacology & therapeutics, 45(5), 631-642. 19 Palmieri, B., Merighi, A., Corbascio, D., Rottigni, V., Fistetto, G., & Esposito, A., (2013). Fixed combination of hyaluronic acid and chondroitin-sulphate oral formulation in a randomized double blind, placebo-controlled study for the treatment of symptoms in patients with non-erosive gastroesophageal reflux. Eur Rev Med Pharmacol Sci., 17(24):3272-8. 20 Gerdin,B, & Hällgren, R., (1997). Dynamic role of hyaluronan (HYA) in connective tissue activation and inflammation. J Intern Med.,242(1):49-55. 21 Moskowitz, R.W., (2000). Hyaluronic acid supplementation. Curr Rheumatol Rep. 2(6):466-71.0. 22 Sherman, S.L., Matsumoto, S., Weiping, S, Taasin, S., & Back, S.A., (2015). Hyaluronan synthesis, catabolism, and signaling in neurodegenerative diseases, a review article. international Journal of Cell Biology Vol. 2015, Article ID 368584, 10 pages DOI: http://dx.doi.org/10.1155/2015/368584. 23 Borumand, M., & Sibilla, S., (2015). Effects of a nutritional supplement containing collagen peptides on skin elasticity, hydration and wrinkles. Journal of Medical Nutrition & Nutraceuticals 4 (1):47-53. 24 Gerdin,B., & Hällgren, R., (1997). Dynamic role of hyaluronan (HYA) in connective tissue activation and inflammation. J Intern Med.,242(1):49-55.). 25 Litwiniuk, M., Krejner, A., Speyrer, M.S., Gauto, A.R., & Grzela, T., (2016). Hyaluronic Acid in Inflammation and Tissue Regeneration. Wounds., 28(3):78-88. 27 de la Motte C. A., (2011). Hyaluronan in intestinal homeostasis and inflammation: implications for fibrosis. American journal of physiology. Gastrointestinal and liver physiology, 301(6), G945-9. 28 Abduljabbar, M., H., & Basendwh, M.A., (2016). Complications of hyaluronic acid fillers and their managements. Journal of Dermatology & Dermatologic Surgery., 20(2): 100-106. DOI: https://doi.org/10.1016/j.jdds.2016.01.001Get rights and content. 29 Papakonstantinou, E., Roth, M., & Karakiulakis, G. (2012). Hyaluronic acid: A key molecule in skin aging. Dermato-endocrinology, 4(3), 253-8.30 Stancikova, M., Svik, K., Istok, R., Rovensky, J., & Velebny, V., (2004). The effects of hyaluronan on bone resorption and bone mineral density in a rat model of estrogen deficiency induced osteopenia. International Journal of Tissue React, 26(1-2):9-16. 31 Ma, J., Granton, P.V., Holdsworth, D.W., & Turley, E.A., (2013). Oral adminstration of hyaluronan reduces bone turnover in ovariectomized rats. Journal of Agric Food Chem, 61(2):339-345. DOI: 10.1021/jf3—651d. 32 Huang, L., Cheng Y.Y., Koo, PL, Lee, K.M., Qin, L., Cheng JC, & Kumta SM.,( 2003). The effect of hyaluronan on osteoblast proliferation and differentiation in rat calvarial-derived cell cultures. J Biomed Mater Res A. 66(4):880-4. DOI: 10.1002/jbm.a.10535. 33 Lajeunesse D1, Delalandre A, Martel-Pelletier J, Pelletier JP., (2003). Hyaluronic acid reverses the abnormal synthetic activity of human osteoarthritic subchondral bone osteoblasts. Bone, 33(4):703-10. 34 Kogan, G., Soltés, L., Stern, R., & Gemeiner, P., (2007). Hyaluronic acid: a natural biopolymer with a broad range of biomedical and industrial applications. Biotechnol Lett, 29(1):17-25. 35 Nobile, V., Buonocore, D., Michelotti, A., & Marzatico, F. (2014). Anti-aging and filling efficacy of six types hyaluronic acid-based dermo-cosmetic treatment: double blind, randomized clinical trial of efficacy and safety. Journal of cosmetic dermatology, 13(4), 277-87. 836 Jegasothy, S. M., Zabolotniaia, V., & Bielfeldt, S. (2014). Efficacy of a New Topical Nano-hyaluronic Acid in Humans. The Journal of clinical and aesthetic dermatology, 7(3), 27-9. 38 Pavicic ,T., Gauglitz, G.G., Lersch, P., Schwach-Abdellaoui, K., Malle, B., Korting, H.C., & Farwick, M., (2011) Efficacy of cream-based novel formulations of hyaluronic acid of different molecular weights in anti-wrinkle treatment J Drugs Dermatol. 10(9):990-1000. 40 Asserin, J., Lati, E, Shioya, T., & Prawitt, J., (2015). The effect of oral collagen peptide supplementation on skin moisture and the dermal collagen network: evidence from an ex vivo model and randomized, placebo- controlled clinical trials. Journal of Cosmetic Dermatology, 14(4):291-301. DOI:10.1111/jocd.12174. 41 Proksch, E., Segger, D., Degwert, J., Schunck, M., Zague, V., & Oesser, S., (2014). Oral supplementation of specific collagen peptides has beneficial effects on human skin physiology: a double-blind, placebo- controlled study. Skin Pharmacology & Physiology 27 (1): 47-55. 43 Jegasothy, S. M., Zabolotniaia, V., & Bielfeldt, S. (2014). Efficacy of a New Topical Nano-hyaluronic Acid in Humans. The Journal of clinical and aesthetic dermatology, 7(3), 27-9. 44 Matsumoto et al (2006). Clinical effect of fish type I collagen hydrolysate on skin properties. ITE Letters on Batteries, New Technologies, and Medicine (with news) 7:386-390. 45 Purves, D., Augustine, G.J., Fitzpatrick D., Katz, L.C., LaMantia, A., NcNamara, O.l, & Williams, S.M. (Ed.s). (2001). Neuronscience. 2nd Ediciton, Sunderland (MA). ISBN: 10:87893-742-0. 46 Sakson-Obada, O.l, & Wycisk, J. (2015). The body, self and frequency, intensity and acceptance of menopausal symptoms. Menopause Review, 14, (2), 82-8947 Iester, M., Orsoni, G.J., Gamba, G., Taffara, M., Mangiafico, P., Giuffrida, S., & Rolando, M., (2000). Improvement of the ocular surface using hypotonic 0.4% hyaluronic acid drops in keratoconjunctivitis sicca. Eye, 14 (Pt 6):892-8. DOI:10.1038/eye.2000.244. 48 Pinto-Fraga, J., López-de la Rosa, A., Blázquez Arauzo, F., Urbano Rodríguez, R., & González-García, M.J., (2017). Efficacy and Safety of 0.2% Hyaluronic Acid in the Management of Dry Eye Disease. Eye Contact Lens. 43(1):57-63. DOI: 10.1097/ICL.0000000000000236. 49 Troiano, P., & Monaco, G.,(2008). Effect of hypotonic 0.4% hyaluronic acid drops in dry eye patients: a cross- over study. Cornea.27(10):1126-30. DOI: 10.1097/ICO.0b013e318180e55c.